Usually I try to post every year on the death date of Aphra Behn, the first professional woman writer in the English language. I missed it this year (April 16) for a number of reasons, the main one being that I was preparing for the Villa Diodati Workshop, reading stories and writing critiques. Aphra entered the playhouse with more confidence than she felt. The portly playwright, poet laureate of the realm, was giving instructions to the actors and actresses. “Wait here,” she said to her maid. Katherine nodded. Aphra felt a surge of sick disappointment. “Nay. I wanted to give him this.” Aphra took the linen cover off the basket she was carrying and pulled out a feathered headdress. The actress gasped. “I had something particular to give him,” Aphra stammered. Dryden raised his eyebrows but said nothing. The actress shook her dark head and smiled. “The times are changing, are they not, Mr. Dryden? Women are already actresses. Perhaps playwrights next?” Dryden didn’t look pleased, and Mrs. Marshall gave Aphra a conspiratorial wink. “Good day, Mr. Dryden, Mrs. Marshall,” Aphra said curtseying, and turned to leave. The actress and the playwright watched the copper-haired woman and her maid leave the theater. “A woman playwright would be quite a novelty, would it not?” Anne Marshall said, baiting the playwright, not well-liked among the actors. “That it would,” Dryden agreed. “Enough of a novelty to mean serious competition?” the actress added, a malicious gleam in her eye. For the month of March, I’m offering a special introductory price of only 99c to get the ball rolling. I can’t reduce the price on Kobo yet, however, because I signed up for a promo where the minimum price must be at least 2.99. Writing this blog post, I also noticed that the sale price has not gone through everywhere. Soon, I promise! We have another big sale coming your way to start the new year, over 100 eBooks in science fiction and fantasy genres, all for only 99c each. Just go to http://pattyjansen.com/promo/ and click on your favorite retailer to see what’s available! The promo officially begins tomorrow, January 7, but a lot of books have already reduced the price. Over 100 great SFF ebooks this weekend for only 99c each! The monthly specfic promo is here again, this time with over 100 ebooks in science fiction and fantasy, all for only 99c! We have another great promo for fans of science fiction and fantasy this month — over 100 books, all for only 99c! The sale officially starts tomorrow, Sept. 3, but a lot of the books are already reduced in price. Like my contribution, Shadow of Stone. the second book in the Pendragon Chronicles series, available on Amazon for only 99c. Or my collection of short stories, Oregon Elsewise, available on B&N, Kobo and Apple for only 99c. So check out the sale, and good luck finding something you want! I just noticed that a book that has helped me a lot in organizing a couple of recalcitrant manuscripts is on sale today for only 99c — a book I paid full price for! 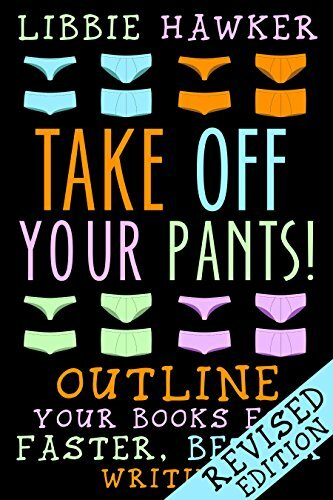 *g* It’s Libbie Hawker’s Take Off Your Pants: Outline Your Books for Faster, Better Writing. I admit, I can’t tell you yet whether her method works to create more successful books, since I have only applied it to a couple of books that are still WIPs, including the Pendragon Chronicle prequel that I’m working on right now, Ygerna. But what I can tell you is that when I dug the notes and scenes I had written a while back out again and applied Libbie’s plotting method to them, I finally had the feeling that I had a story that made sense and that I could finally finish. Another thing I like about this structure is that it doesn’t insist that the main goal is clear right from the beginning. Not only that, it admits that the main goal could well be tied to the character’s flaw — which will eventually have to be overcome. It reminds me of another piece of writing advice that I’ve been internalizing for a long time now: remember to distinguish between what your main character wants and what she needs. Over 100 Science Fiction and Fantasy books for only 99c each! It’s that time of the month again — when we roll out another big Science Fiction and Fantasy ebook sale!. 🙂 July 2-3 you can get over 100 Science Fiction and Fantasy books, organized according to store and sub-genre, all for only 99c each. My contribution this month is the collection of previously published short stories that I wrote with Jay Lake, who we lost two years ago last month, Almost All the Way Home From the Stars. The monthly Science Fiction and Fantasy group promo is here again, and this weekend, May 7-8, we have an amazing lineup of over 150 ebooks for only 99c each! It officially starts tomorrow, but many of the books are already on sale. My contribution this month is the box set of Looking Through Lace and Beyond the Waters of the World. Giant 99c SFF Box Set Sale, Feb. 6-7! My own contribution is Yseult, Books 1-4, on sale for 99c through tomorrow, Feb. 7. Big 99c Science Fiction and Fantasy sale! 84 authors and 84 books! Check out the big 99c ebook sale this weekend, Dec. 5-6. That’s right, two days only! 84 authors to try, 84 books for your perusal!